In 2009 a small handful of community leaders decided to organize likeminded residents to address the needs of their neighborhood. Elizabeth Gardner, Deidre Jenkins, and Wendy Walker Williams established the Woodlawn Community Summit with less than 50 people, but built a model for civic leadership that would pay major dividends throughout the near South Side Chicago for years to come. The Summit is an opportunity for collaboration that brings residents, business owners, and stakeholders together to create a united vision that will strengthen and develop Chicago’s Woodlawn neighborhood and the surrounding communities. 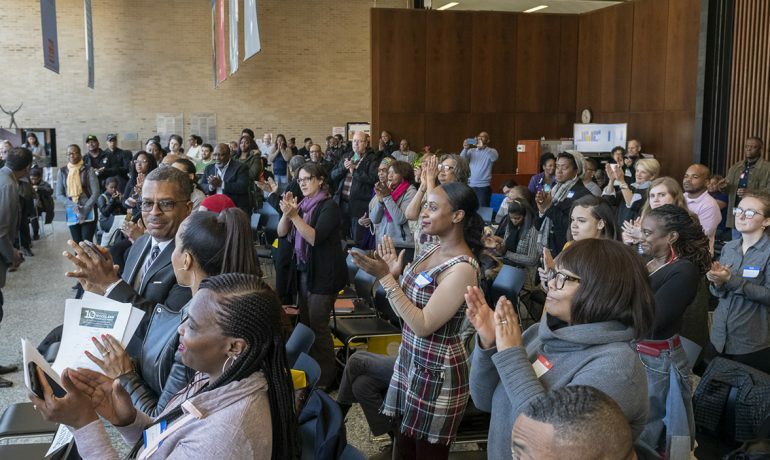 In 2019 the Woodlawn Community Summit celebrated its 10th anniversary on March 16th at the University of Chicago’s School of Social Services Administration. Each year brings an energizing morning of reflection and action for the neighborhood and businesses, providing access to creative solutions to community issues and opportunities to connect a network of resources and support. Organized by a dedicated committee of two dozen leaders, the Woodlawn Community Summit demonstrated its long-term viability for civic engagement. For the 10th anniversary more than 500 attendees were registered online in only 15 days. Survey data identified 75% of registrants were 35 years or older, but the Summit also hosted a dozen youth under 18 years old. Of those responding to the survey, 46% of the registrants do not currently live in Woodlawn, but may work or live nearby, while 23% of attendees have lived in Woodlawn more than 10 years. All of those registered attendees found it extremely important to be connected to the changes and opportunities forthcoming. See the Photos (Flickr Gallery). The Summit’s thematic “Celebration of Community Spirit” was personified as the founders recognized generous contributors and partnering organizations including CEI Media Group, Network of Woodlawn/Brazier Foundation, Northwestern Medicine, Preservation of Affordable Housing (POAH), University of Chicago’s Office of Civic Engagement and School of Social Service Administration. Throughout its development, the Summit also showcased appreciation for City of Chicago 5th Ward and 20th Ward Aldermanic offices and South East Chicago Commission, which has championed and managed the Summit since its inception. The 10th Anniversary featured a special keynote address by Jahmal Cole, Founder of My Block, My Hood, My City. Cole is also the author of The Torch of Decency: Rekindling the Spirit of Community Organizations, Athletes & MC’s and 50 Excuses: To Not Follow Your Dreams. Cole’s candid truth included poignant and often overlooked concerns, and his dedication to civic leadership and challenge to the community was received with a standing ovation. After the keynote presentation, Summit attendees participated in thought-leader panel discussions on economic development, housing and sustainability. More than 20 organizations, agencies, and partners offered essential resources for residents and business owners. At the conclusion of the Summit, 12% of attendees also boarded luxury buses for a tour of available housing stock in the nearby communities. Front Row from Left: Naomi Denise Davis, Elizabeth Gardner, Deidre McGraw, Kamaria Ngozi, Ticina Williams. 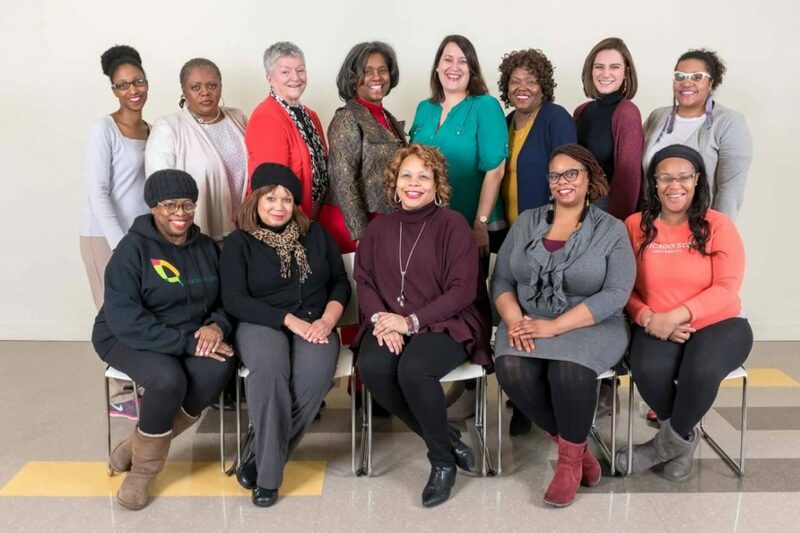 Back Row from Left: Jawanda Hairston, Felicia Dawson, Terri Kilbane, Paula Grantt, Diane Burnham, Sandra Bivens, Rebecca Bretz, and Avents-Alicia August Wright. Not pictured: Byron Freelon, Joyce Nimocks, Rudy Nimocks, Lisa Parks, Raymonde Vance, and Wendy Walker Williams. 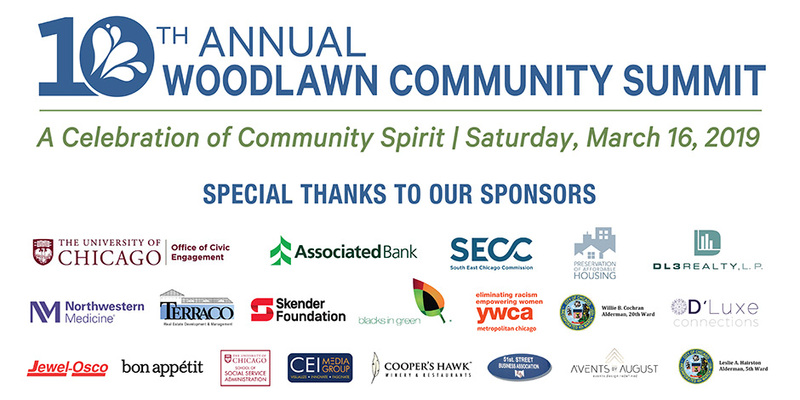 Special thanks to the 2019 sponsors: University of Chicago’s Office of Civic Engagement, Associated Bank, N.A., South East Chicago Commission, Preservation of Affordable Housing, DL3 Realty Northwestern Medicine, Skender Foundation, Terraco, Blacks in Green, YWCA of Metropolitan Chicago, 20th Ward Aldermanic Office, D’Luxe Connections, Jewel-Osco, bon appetit, School of Social Service Administration, CEI Media Group, Cooper’s Hawk Winery & Restaurant, 51st Street Business Association, A’vents by August and 5th Ward Aldermanic Office.